As Yule approaches, the days get shorter, the nights longer. In the northern hemisphere, winter is beginning to take hold, and it is getting colder. Yule is celebrated on the longest night of the year, which varies, depending on the year, between December 21 and December 22. This is the Winter Solstice and pagans traditionally celebrate the return of the sun at this time, though it is only the beginning of winter and the coldest days are yet to come. At Yule (from the Norse word for “wheel”), the sun is reborn. According to Wiccan lore, the Goddess gives birth to the “Child of Promise” and the time of the Holly King ends when the time of the Oak King begins. This is a time of introspection when, in cold climates, everything in nature sleeps through the cold winter. But it is also a time of hope as one becomes aware that as the sun eventually returns, so will everything in nature awaken and be reborn. The celebrations during Yule reflect all of this, and in the past, pagans would celebrate with rituals, feasting, and festivities. According to D. J. Conway, in his book Wicca: The Complete Craft, decorating the home with holly boughs at Yule is an ancient Pagan custom. 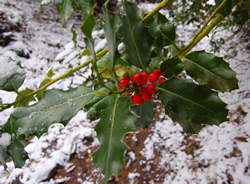 Holly was also used for protection and warding off harmful spells. Ivy was used to symbolize the endurance of life, mistletoe for fertility and love. The Yule tree is an important part of Wiccan tradition for many who practice the Craft, and it is traditionally done with respect and acknowledgement of the spirit of the tree. The crux of the message is that the tree is to be cherished and loved. Traditionally, the family then takes it home to be put in a place of honour and decorated. When the celebrations for Yule are completed, the tree is not simply thrown out. The tree becomes the Yule log for the following year’s celebrations. In the McQueen household, the tree is saved each year, and the following year, the family cuts a section of the tree from the previous year to use as a Yule log. They carve three holes into the log to place candles in and decorate the log with ivy. The rest of the tree is burned in the fireplace or outside if there is a Yule fire during the celebrations. The Yule tree is never wasted, but used for light and warmth, and always treated with honour and respect. There are many ways to celebrate Yule, but the point is to have fun, enjoy the season, and celebrate the return of the sun with friends and loved ones. Celebrating Yule is a fun and sociable thing to do when it’s so dull and cold outside. Any greenery left over from Yule celebrations can be saved to use at the next celebration, as the Wheel of the Year turns again, and brings us to Imbolc on February 2nd. Bunn, Louise, Book of Shadows: Participant’s Handbook for Paganism 101, Vancouver: Louise Bunn, 1998. Farrar, Janet and Stewart, A Witches’ Bible: The Complete Witches’ Handbook, Custer: Phoenix Publishing inc., 1996. Gallagher, Ann-Marie, The Wicca Bible, New York: Sterling Publishing Co., 2005. McQueen, Jeff, Priest, 1st degree, the Wiccan Church of Canada. Disclaimer: The information on this website is not intended to substitute advice from your physician or health-care professional. Before beginning any health or diet program, consult your physician. Get Website Hosting at HostingCT! Copyright 2005 - 2018. All rights reserved.